Setting a password on an MS-Word file is a good way to keep the content safe from unauthorized access. Learn how to protect your MS-Word files with a password. Microsoft Word is perhaps the world’s most used word processing software. It is used for creating all sorts of documents and some of them happened to be confidential. Although a computer file can be secured at various levels, let’s learn how to put a password on an MS Word ducoment. Why Such Protecting Word Document with Password is Good? Putting a password on MS-Word document provides a simple way to keep secret data secret. 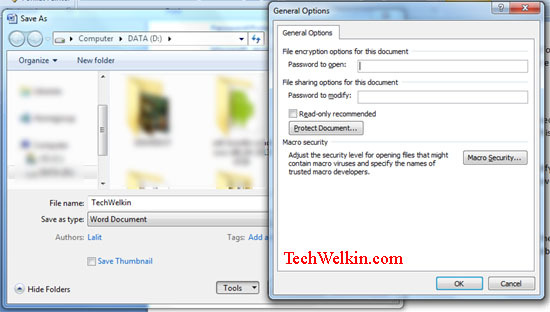 When a user will try to open a secured file –Word will asked for the password. It is as simple as that. This is so easy that one does not need to be a power user to set password and open secured files. Moreover, you can set yet another password that will be asked if a user tries to modify a protected file. Effectively, password to open makes a file read only. But if the user also knows password to modify –she can make changes and save the file. NOTE: This article is part of our MS-Word How-to Guide. Have a look at it to learn more useful tips. Open an existing Word document or create a new one. Password is set at the time of saving the document. If you want to set password on an already saved file, then go to Office Orb button (round button given in the top-left corner) and select “Save as” option. Password to open: This will be asked for when the file will be opened. Content of the file will not be shown unless password is provided. Password to modify: If this password is set, user will be asked to provide this password when she will try to save the changes made. MS Word password schemes are fairly good but you should try to set a strong and non-guessable password to enhance security. Earlier I had published a list of weakest passwords (use our strong password generator) often used by computer users. Try not to give any password mentioned in this list! Please let me know if you have any questions on this subject. I will try to answer it! Thank you for using TechWelkin. Thank you for the simplest but most effective explanation of my query!!! I have to create 5 boxes ( cells / tables) in a single WORD/ PDF/ PP – file with 5 different passwords. 1st person opens the 1st box with his password and he writes his command and saves it. 2nd person opens the 2nd box with his password and he writes his command and saves it and so on. But one person should not be able to edit any other person’s boxes other than his own. An MS Word file can have only one password (a second password may be used for allowing editing).